Visually impaired musicians participate in every area of music. They are vocalists, pianists and drummers; they play every instrument imaginable, learn to sight-sing; and read and compose music. Children who are visually impaired learn music in much the same way they learn other material—with special tools and technology. With the right tools, visually impaired children have the same potential and ability as other children to develop their talents and engage in musical creativity. Determine the needs of your visually impaired student. If your student has limited vision, magnification may suffice to help him learn music. If he is completely blind, you will need Braille materials and assistive technology for the blind. Enroll the student in a class or arrange for private lessons. If appropriate, make sure your student has access to his instrument of choice for regular practice. If he uses computer technology to learn music, classes or lessons must take place in a location that accommodates the technology. Purchase or borrow the Braille music book. Braille music provides the same information found on sheet music. You do not need to know Braille to use the Braille music book to teach a blind student. Regular print teacher instructions are included on each page. Allow your student time to learn the Braille music code, which differs slightly from the Braille literary code, until she becomes comfortable with using it. 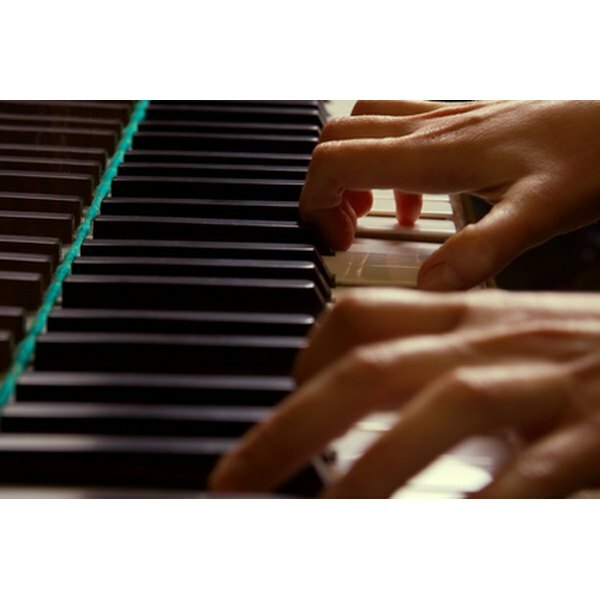 While vocalists can read Braille music and sing simultaneously, pianists learn to read, memorize and then play. Once your student understands Braille music, he can participate fully in all music activities, including the study of music theory and reading musical scores. Purchase or obtain access to music technology for blind students. Blind musicians use computer software for scanning sheet music, transcribing and print-to-Braille conversion. Use technology like audio software, screen readers, speech synthesizers, MIDI sequencers, notation software and keyboards to help your student learn, practice and perfect her music skills. Use Braille music translation software to produce Braille music sheets if your student is part of a band or ensemble. Use screen magnifiers and large print materials for visually impaired children with some sight. These materials may be helpful in combination with other technology, such as voice synthesizers, for students with limited vision. Teach your student the fundamentals of music and allow time for him to master the lessons. Use early lessons, before working with Braille music readings, to help your student become familiar with rhythm values, intervals, numbers in the scale and the letters that correspond to musical notes. Locate sources for Braille music sheets. The National Library Service, which is the largest source of printed material for the blind, can also help locate certified transcribers. Purchase or download and print Braille music charts. Contact the National Resource Center for Blind Musicians for information, suggestions, and assistance. Stay connected with the resource center and similar organizations to keep up with best practices and new technologies. Is a Strapless Heart Rate Monitor Better?